Did you know about all the screen elements of your Wolf Designer? The Web Based Wolf Application Designer comes equipped with a large set of screen elements to assist you in building your custom web based business applications. 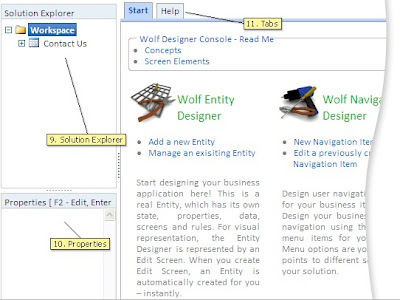 To familarize ourselves with the Web Based Wolf Application Designer, lets have a look at the console layout and the various screen elements. The first thing to notice are the various buttons provided on the upper half of the Wolf Designer . Next, we consider the other elements of the Wolf Designer . Note - All Screen elements change as per your selection in the solution explorer. Every time you click on a node in the Solution Explorer window the Tools, Properties and Tabs will adjust their display automatically. Let us consider each of these screen elements in turn and see how they can assist us in quickly building custom web apps. 1. New - Drop down which presents you with the types of nodes that can be added under the current node. 2. Open - Drop down which presents you with the list of previously added/saved nodes that can be opened at the level of the current node. This is useful only at the topmost node level. 3. Close - Closes the currently selected node. 4. Remove - Removes the Currently selected node. 5. Move Up/Down - Moves the currently selected node up or down. 6.Save - Saves the root node for the currently selected node. Most of the previews where ever applicable are generated when the save tool is clicked. 7. Publish - Publish is what you will click before you want to test your changes in the Runtime Interface. This moves the changes into a published state. All changes to the selected node will be made public. 8. Run - Invoke Wolf Runtime Interface. 9. Solution Explorer - This is more like a navigation pane. The Selected node controls the environment around the screen. 10. Properties - The list of available properties and their existing values (if any in the case of saved elements). Changing the properties of a selected node will change behaviour during Runtime. The changes will reflect in available previews only after Save/Publish and subsequent Refreshing of the preview pane. The effect of the changes are explained in the help tab . 11. Tabs - The Start and the Help tab are static. Other tabs will open based on the selected node and their configured previews. Many nodes do not have any associated previews so don't be alarmed if there is no action in this part of the screen when you make a selection. MOST Importantly - If you want to refresh the complete environment use CTRL + F5 and not F5 . To refresh the previews you can right click and refresh inside the respected tab content area. There you have it... a list of screen elements which will enable you to build your Web Apps in the easiest and quickest possible way .